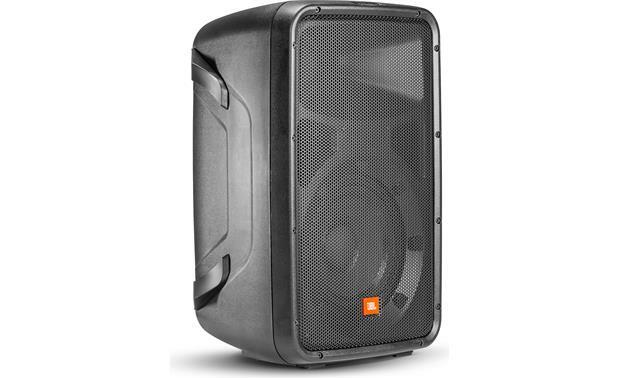 JBL's EON Series powered speakers have set the bar for performance over the last few years. By buying this product you'll earn up to 699 Rewards points. 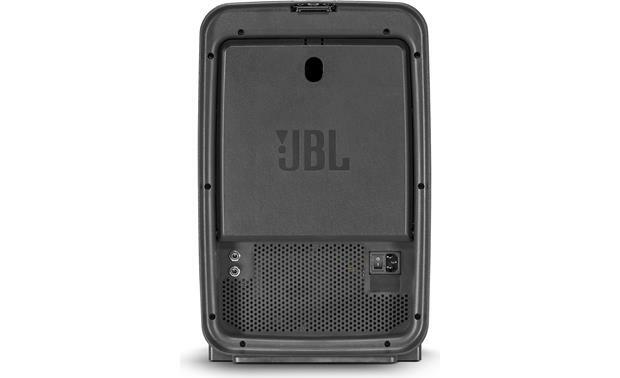 JBL's EON Series powered speakers have set the bar for performance over the last few years. 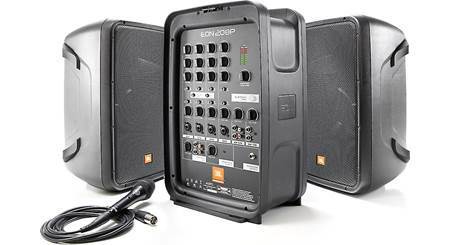 Now, JBL offers the EON 208P portable self-contained PA system — two familiar EON-style cabinets which latch onto a central module containing the mixer and power amp. The entire package weighs only 38 pounds, yet gives you a complete PA system with 300 watts of power. 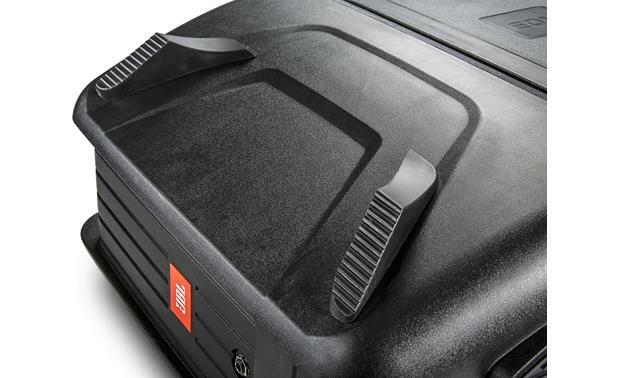 The power cords for the mixer unit and the speaker connecting cables even have their own storage space. 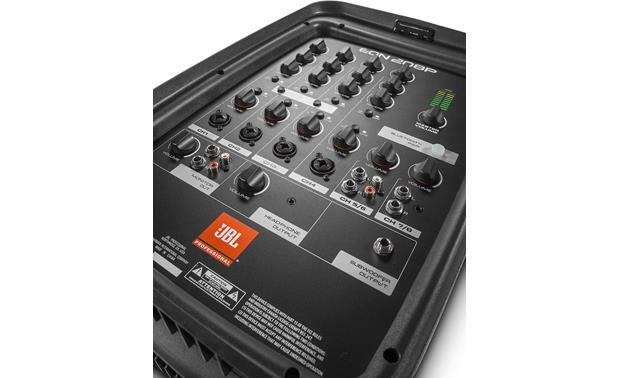 The 8-channel mixer offers all the connections and features you need for a good show. 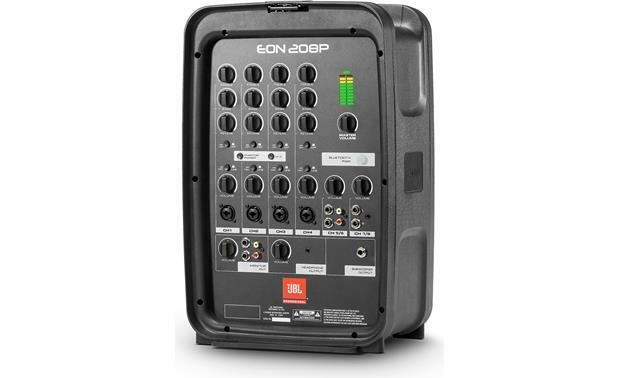 Channels 1-4 have inputs for line (1/4") and microphone (XLR) connections, along with tone controls and onboard reverb. Channels 1 and 2 feature switchable phantom power for your mics. Channel 3 features a Hi-Z switch for use with guitars and other instruments. Channels 5/6 offer RCA and 1/4" balanced connectors and a volume control. Channels 7/8 offer a set of RCA inputs and accept a 3.5mm plug from your personal media devices. 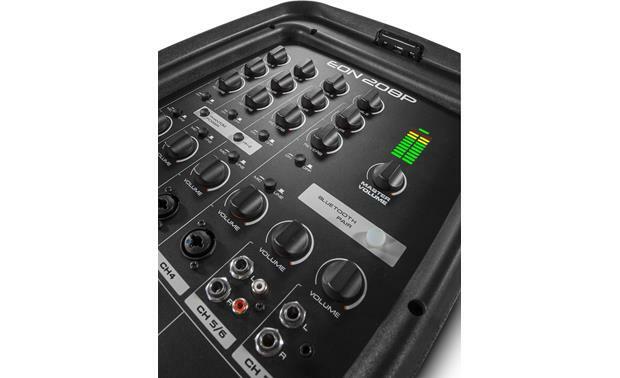 The mixer features Bluetooth connectivity, allowing you to stream audio to the mixer from your mobile devices. 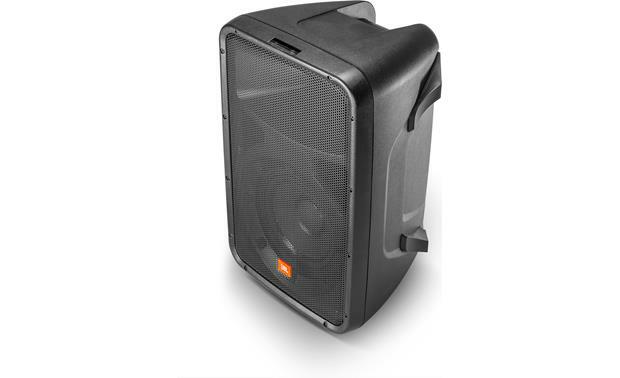 This makes the 208P ideal for health clubs, houses of worship, presentations, and other applications where pre-recorded material is played. 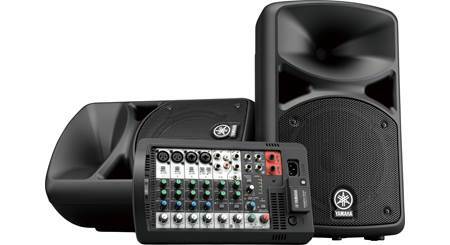 The mixer also features RCA and 1/4" monitor outputs that let you connect with recording gear, additional powered speakers, or another mixer, along with a subwoofer output to connect a powered sub. 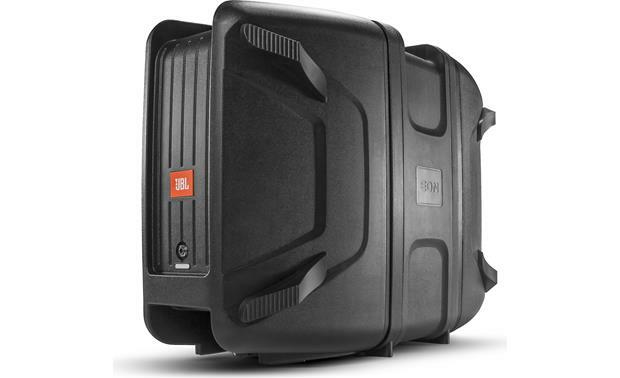 JBL designed these EON speakers for portability and quality sound. The 8" woofers lay down the low end, while the 1" nylon tweeters fill in the details. 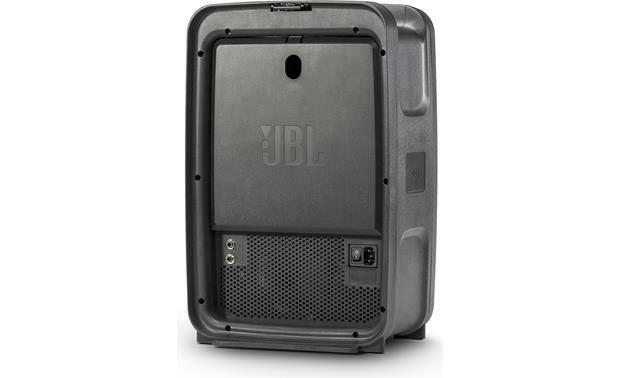 Polypropylene enclosures with perforated steel grilles protect the speakers from bumps and dings. The speakers also feature standard 36mm pole sockets. 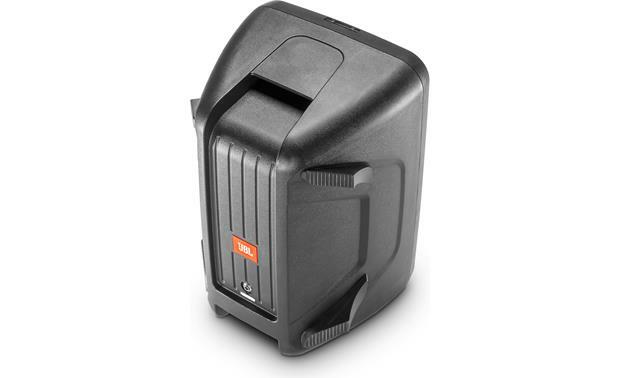 package dimensions: 22-5/8" x 30-1/2" x 15-3/4"
We use these when interacting with the public at radio station events. They work perfectly and are very portable. Yes, via RCA cables. This doesn't have an HDMI connection, it optical audio cable connection, however. 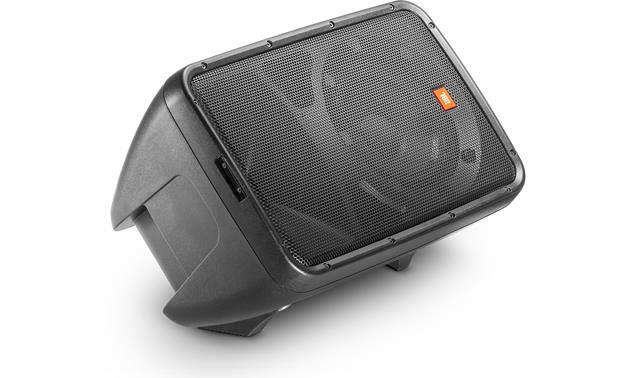 All-In-One Portable PA System: The JBL EON208P is a self-contained, portable PA system consisting of two powered loudspeakers and a detachable powered mixer with an enclosed storage compartment, one pair of unshielded speaker cables and a power cord. Featuring multiple input channels with individual tone controls, reverb and convenient sound output capabilities allow you to integrate the system into any number of audio environments. 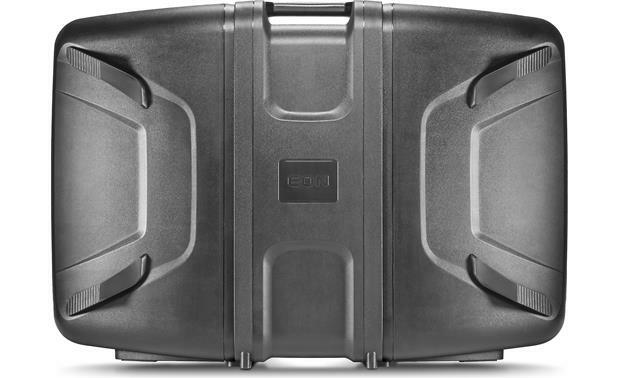 With its lightweight and ergonomic design, the EON208P is an easy to use, lightweight package with un-compromised sound quality. 160W Class D Amplifier: The powered mixer employs a 300W class D amplifier which supplies 150 watts of power to each speaker of the PA system. 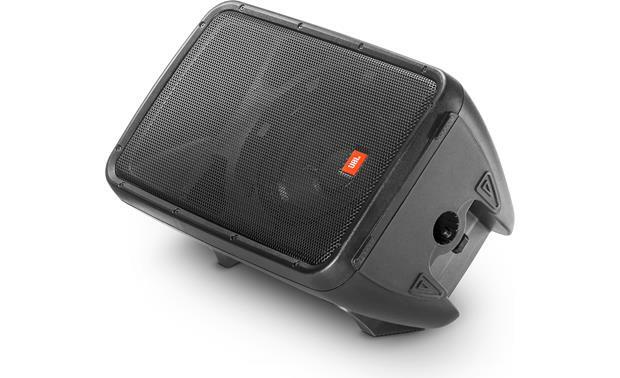 Two-Way Bass-Reflex Speakers: In addition to the powered mixer, the JBL EON208P consists of dual two-way speakers. Each two-way speaker is comprised of a 8" woofer and a 1" tweeter coupled to a 100° H by 60° V waveguide. 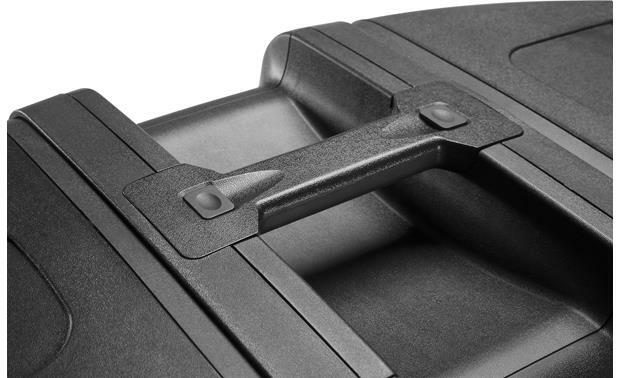 A bass reflex port on each speaker enclosure provides greater efficiency and bigger bass output. 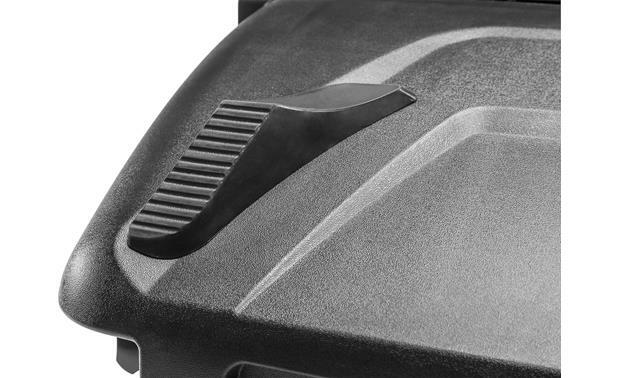 Each speaker features a rear-panel 1/4" jack. 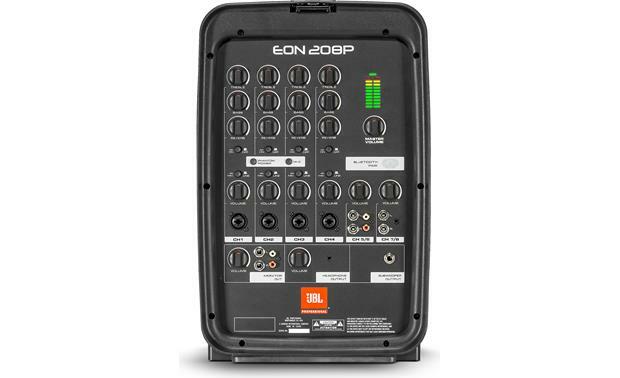 8-Channel Mixer: The EON208P's powered mixer has eight inputs; four mono mic/line inputs and two stereo inputs. 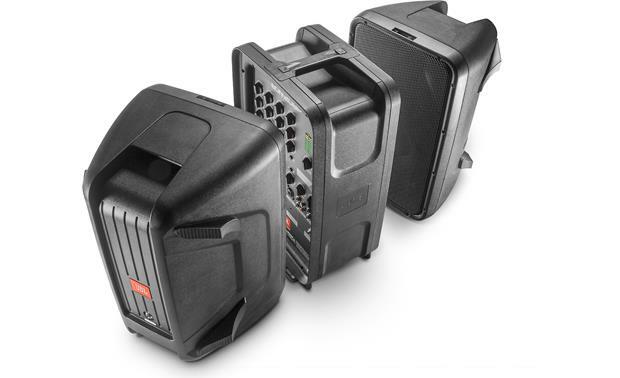 Each mono mic/line input (1-4) consists of a combo connector that will accept either a XLR (mic) or 1/4" (line) input. The 5/6 stereo input consists of a pair of balanced 1/4" TRS jacks or unbalanced stereo RCA jacks. The 7/8 stereo input consists of a stereo minijack (3.5mm) input jack and stereo 1/4" TRS jacks. 1-2 Mic/Line Inputs: Use these combo connectors to connect a microphone via XLR or a line-level device via 1/4". 3-4 Mic/Line Inputs: Use these combo connectors to connect a microphone via XLR or a line-level device via 1/4". 5/6 Stereo Inputs: Use either the stereo 1/4" TRS or RCA jacks to connect a electronic keyboard, instrument pre-amp, or processor. 7/8 Stereo Input: Use this stereo minijack (3.5mm) input to connect a portable audio player, such as your Apple iPod/iPhone/iPad or Android smartphone/tablet. Or, use either the stereo 1/4" TRS jacks to connect a electronic keyboard, instrument pre-amp, or processor. 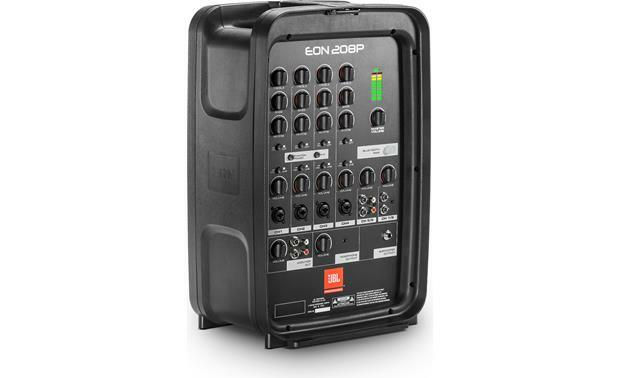 Bluetooth Audio Streaming: The EON208P offers built-in Bluetooth, so you can pair a Bluetooth audio device and stream audio from the device to the portable PA system. Outputs: The powered mixer provides stereo speaker outputs, stereo monitor output, headphone jack, and sub output..
Speaker Outputs: These stereo 1/4" speaker outputs are used to connect the included two-way speakers using the supplied speaker cable. Monitor Out: The stereo RCA "Monitor Output" allows you to route the stereo mixer signal to another destination like a recording device, personal monitor, subwoofer, or another PA system. Headphone Output: The 3.5mm headphone ouput lets you connect a set of headphones. 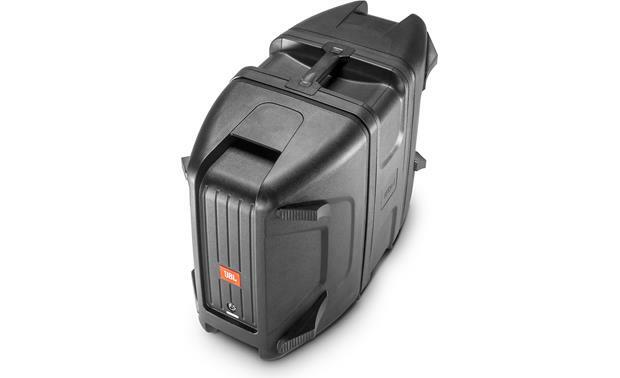 Subwoofer Output: The 1/4" TRS subwoofer output allows you to route the main mixer output to a powered subwoofer. 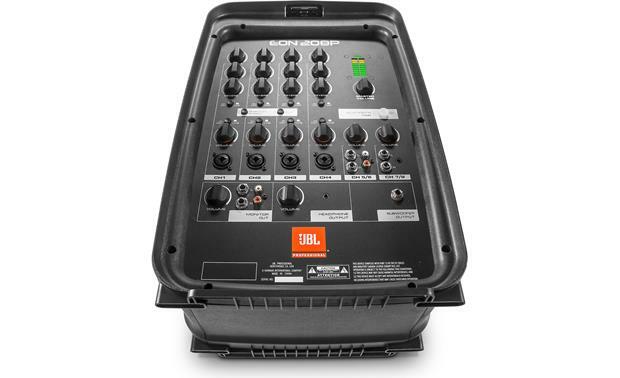 Mixer Controls: The JBL EON208P's powered mixer offers independent volume control for the mono and stereo channels, as well as an overall master volume. You also get tone control and reverb for 1-2 channels. 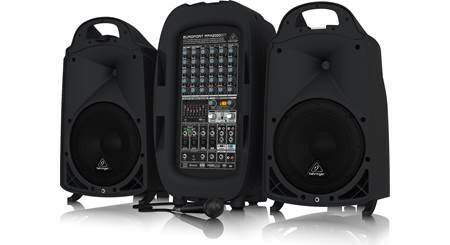 Master Volume: The "Master Volume" control the overall output volume of the portable PA system. Channel Volume: Channels 1, 2, 3, 4, 5/6, & 7/8, offer independent gain control to dial in your source's output level. 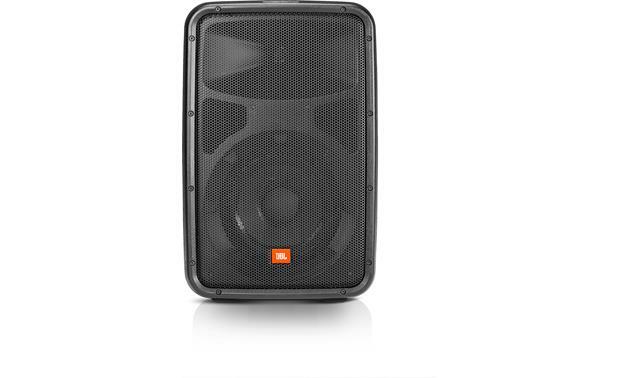 Monitor Volume: You can also independently control the volume of the PA system's monitor output. Headphone Volume: Independently adjust the headphone output's volume without disturbing Master, Channel, or Monitor volume. Tone Control: Independently adjust Bass & Treble for Channels 1-4. Reverb Control: Independently adjust the amount of reverb for Channels 1-4. Hi-Z Selector: Allows you to set the Channel 3 input to high impedance for a guitar signal input. Phantom Power: Enables phantom power for condenser microphones when connected to Channels 1-2. 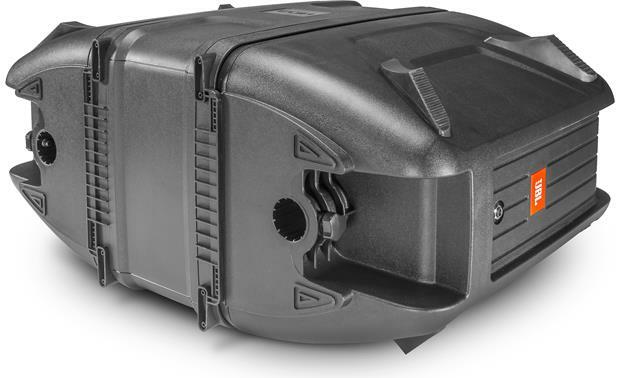 Included AKG Mic: The 208P ships with a handheld AKG vocal mic. 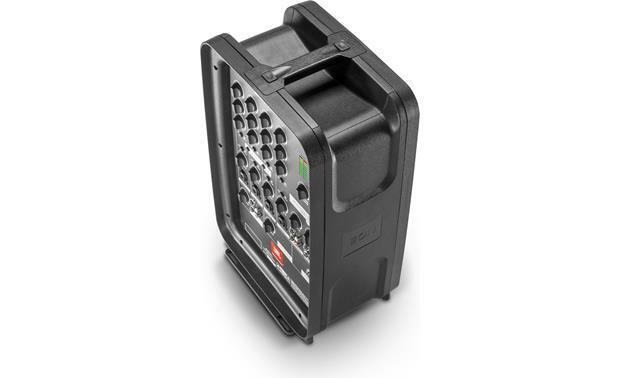 10-Segment LED Meter: The 10-segment LED meter helps you to monitor the level of your mix visually. 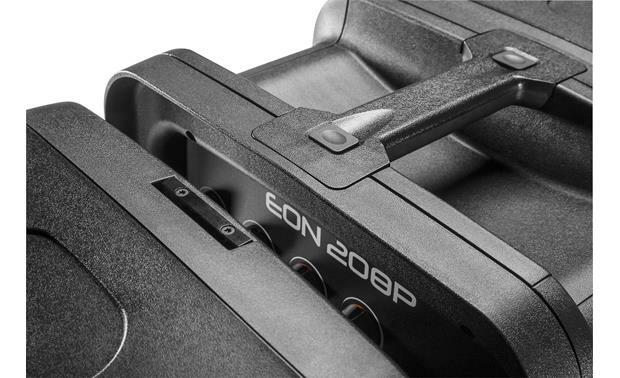 Portable: The EON208P's powered mixer panel and dual full ranged speakers, combine to form a convenient suitcase-like package. 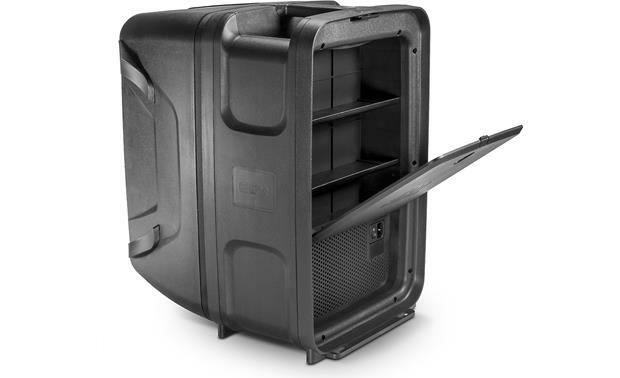 Complete with power and connection cables that go into their own storage space designed to neatly tuck them into when your done. It weighs only 38.8 lbs. 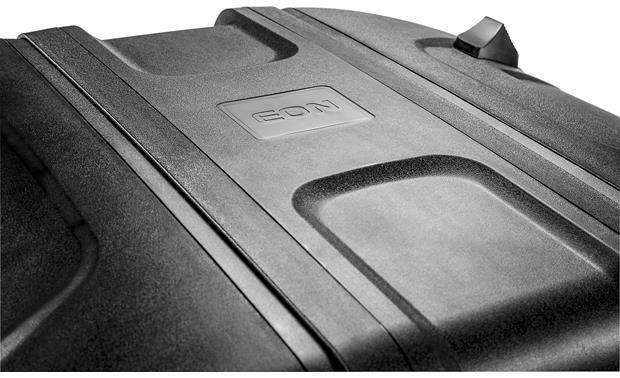 Its ergonomic design makes the EON208P easy to carry, travel, setup and store. 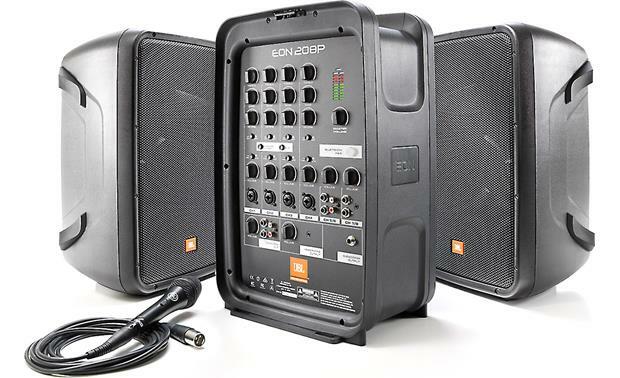 Mounting Options: The EON208P speakers contain a 36mm receptacle cup to allow mounting on tripod stands or on a pole over subwoofers. 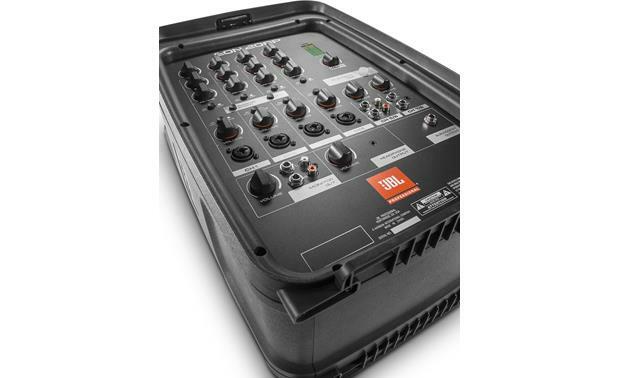 Live sound reinforcement, speech and vocals, music playback in entertainment, A/V, and institutional venues - especially when ease of use and portability are important factors. We plug a portable CD player in it on a regular basis. Works great. what speaker stands would work best with these speakers at a beach? One of our ProAudio advisors will be able to help you with this. 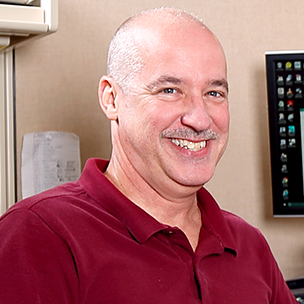 You can reach them directly by dialing: 800-555-9369. 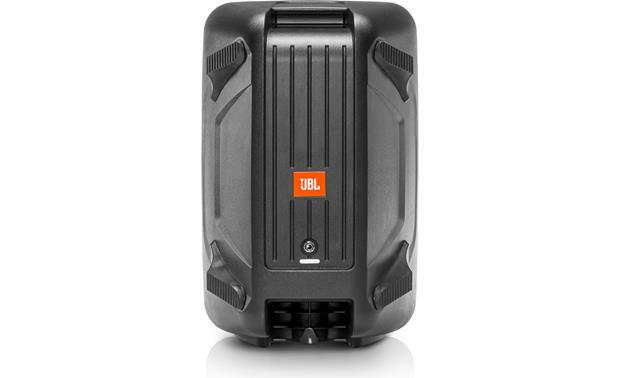 Searches related to the JBL EON208P Portable 300-watt powered PA with 8-channel mixer and Bluetooth®.